Funky Soles is a unique and individual brand based in London. We are putting a twist on trainers, customising by hand using the finest genuine Swarovski crystals. Each pair of Funky Soles feature our signature Swarovski crystal on each shoe. We pride ourselves on all of our products and endeavour to accomplish the highest quality finish. We have been featured in a number of TV shows, Magazines, Online Fashion Sites amongst others. With an eye for detail, a desire to be different and to stand out from the crowd, we used our artistic mind to start creating customised trainers. 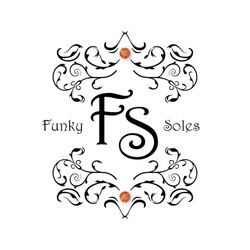 After attracting attention from family, friends and the public, we decided to turn it into a business and Funky Soles was established in 2012. Premiership Footballers, Music Artists, DJ's, Actors, TV Presenters to name but a few.